It's summer. Not officially, but according to the weather. Its too hot to cook much, so I've been trying to eat things like watermelon, popsicles, and salads. Although yesterday I had a personal crisis, and the day off from work, and didn't go outside to realize how hot it was, so I baked a pie and cookies as well as cooking steak for dinner. Did I ever mention that I mastered the macaron? My God they're delicious. And gluten free on purpose! I brought them to a dinner party a few months ago, pistachio with buttercream filling, and they were a huge hit. My supervisors husband has been begging me to make them for him again. Every time I see him. "Please! Jill, when are you going to make those cookies again!" Anyway, I've been eating the poor kids salad. The chop chop salad. Where you take everything in the fridge, maybe run out for one tomato and a head of lettuce (what do you call a honeymooners salad? Lettuce alone!! ), chop it all up in a small dice, and toss it with some homemade salad dressing. If you're gluten-free, don't waste your money buying salad dressing. Even if you're not. Make your own. It's so easy. In my salad, I made a lemon-mustard-parsley dressing that was GREAT. And I'm not a huge mustard fan. Look up some salad dressings online, the formula is simple (1 part vinegar/lemon juice/acid to 3 parts oil) and additions are up to you. I always love a clove or two of garlic resting in my salad dressing for an hour or twelve to give the dressing a kick. Salad is even better if you grow your own vegetables, which I am attempting but nothing is ready to eat except the parsley. whatever other veggies you like, carrots, celery, as well as fruit, kiwi, mango, dried cranberries, go nuts. Chop everything into small pieces, add dressing, toss. Put in a pretty bowl and serve with the salad spoon your sister gave you and the fork your boyfriend gave you to complete the pair. I apologize for the lack of photos. My camera is missing in the move, and my new phone doesn't have the best camera. 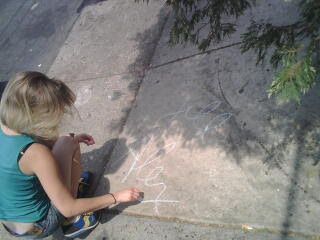 The picture at the top is my sister writing "jill loves alex" on the sidewalk while we waited for seats at The Morning Glory Cafe, which has delicious brunch.